Veeam 9.5 Released: Top New Features - VIRTUALIZATION IS LIFE! 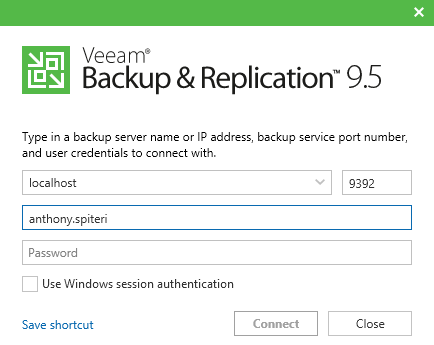 Last week Veeam released to GA version 9.5 of our Backup & Replication product. Even though this is a point release it’s a significant release for Veeam and looks to build on the scalability and reliability that came with previous versions, on top of what was delivered in the v9 release. I’ve spent some time going through the What’s New document as well as the Release Notes and I’ve pulled out my top new features across all areas of the platform…Without question I believe that the features and enhancements listed should make existing Veeam customers upgrade at their first opportunity. In general there has been a doubling of I/O performance that can shorten backup windows by up to five times while reducing the load on core virtualisation platform components such as vCenter and storage arrays. Advanced Data Fetcher: This improves backup performance for individual virtual disks while reducing the load on primary storage due to the reduced number of I/O operations required to complete a backup. This is a VMware feature and is used by Backup from Storage Snapshots, Hot Add and Direct NFS modes. VMware vSphere Infrastructure Cache: This maintains an in RAM mirror of vSphere infrastructure hierarchy to accelerate the Building VM list operation when creating or modifying a job. This also removes load from vCenter. The cache is maintained up-to-date with real-time updates via a subscription to vCenter Server infrastructure change events. Being able to recover from disaster quickly and efficiently is an important feature that shouldn’t be underestimated or understated and v9.5 has further improved this. Instant VM Recovery: This has improved performance up to three times specifically around when recovering multiple VMs at once from per-VM backup file chains. Full VM Parallel Processing: This restore restores multiple disks in parallel, similar to the way a backup is performed. This is automatically used for all disk based backup repositories except Data Domain deduplicating storage. Version 9.5 includes a wide range of additional enhancements targeted at large environments to maintain efficiency when processing jobs containing thousands of VMs allowing for scalability improvements. Database optimisations have allowed queries to complete faster reducing back-end SQL Server load that improves user interface responsiveness and job performance. ReFS is now the preferred disk data format for Windows Server 2016. This updated version provides many new capabilities including improvements data integrity, resiliency and availability as well as speed and efficiency. Fast Clone Technology: This allows for the creation and transformation of synthetic full backup files to happen up to 20x faster for shorter backup windows and a significantly reduced backup storage load. Backup and restore performance can be further improved with automatic storage tiering provided by a Storage Spaces Direct-based backup repository with an SSD tier. Reduced Backup Storage Consumption: Spaceless full backup technology prevents duplication from occurring resulting in raw disk space consumption by a GFS backup archive that rivals deduplicating appliances. By integrating software dedupe and encryption with ReFS capabilities these storage savings remain in play for encrypted backup files which is significant. Backup Archive Integrity: This is addressing silent data corruption by monitoring and proactively reporting data corruption with ReFS data integrity streams, including automated and seamless healing of corrupted backup file data blocks inline during restore or during periodic scans of the ReFS data scrubber by leveraging Storage Spaces mirror and parity sets. Veeam Cloud Connect enabled VCSPs can manage the disaster recovery of remote offices and tenant locations beyond key servers and services by spinning up backups copied to the Veeam Cloud Connect repositories as Hyper-V VMs. Scalability Enhancements: The Enterprise Manager engine was heavily optimised for large environments and tested against databases containing one million restore points. Reporting performance, Web UI responsiveness and new backup server registration times were significantly improved for large environments. Improved Self-Service Capabilities: With the addition of a self-service backup and restore portal for vCloud Director the Enterprise Manager web UI was enhanced with new capabilities to perform Quick Backup operations on the VMs tab as well as delete backup jobs, backup files and erase individual VMs content from multi VM backup files. GFS retention enhancement: To reduce the requirements for archive repository disk space, the oldest GFS full backup will now be removed before a new GFS full backup file is sealed and a new synthetic full is created. That’s a pretty significant list of the top enhancements as I see it! I haven’t gone into detail around the enhancements for Veeam Cloud Service Providers in this post but I will get a separate post out over the next few days going through the key enhancements for VCSPs. Thanks for sharing these top new features. All the features are really great and very useful but tell me one thing if we upgrade to Veeam 9.5 , do I need to change the license also or license will be the remain same ? Hi Anthony, Thanks for your instant reply. You have cleared my doubt . Thanks once again. If service provider runs 9.5 and Tenant runs 9.0 is that a support design? Hey there Rommel. Yes, that’s correct. It’s backwards compatible.